Australia’s Galapagos, said Ian Derbyshire, the CEO of South Australian Tourism. The fourth icon, after the Rock, the reef, the bridge and the roo, said the staff in Tourism Australia (they recently tried the more alliterative rock, reef, roof – Sydney opera House – and now the roo). The focus of all this icon making is Kangaroo Island, a red-soil island 80 miles off the coast south of Adelaide, and the natural haven for many of the continent’s most harassed animal and plant life. Here you will find Australia’s rarest cockatoo, the Glossy Black. It was a pleasant thought, and I expected to land after our 18 minute flight on an island that resembled Inishmore. Instead I got a large long and diverse landmass 155km long and up to 55km wide, almost exactly the size of Tipperary. There are 120 species of birds here. The placenames are bilingual, but it is two European languages, because Kangaroo had no aborigines when the Europeans landed. Competitive mapping, you might call it. The French and the English arrived within three days of each other and merrily went round the place naming bays after themselves and their mates. Matt Flinders, the Englishman, described the bays and geography enthusiastically — the place looked like it would support ships, but they were more shallow than expected. One of the early explorers, George Sutherland was even more enthusiastic in 1819 and sent report that Kangaroo Island was verdant. He may have been here in aftermath of bush fire, our guide tells us, because green and verdant it certainly wasn’t and when the first settlers set up a few huts and sent their sheep to roam, they found the place next to useless, upped sticks and went to Adelaide leaving a mulberry tree behind to be photographed by bemused tourists who come to gape at the first European settlement in south Australia. So off we go to see the sea lions at the gloriously misnamed seal cove and find out how Galapagasian Kangaroo Island might be. The sea lions are a story of hope, protected by the reef from the sealskin hunters of 1840s and by isolation from everyone else since then, shuffling along the sand like Cleopatra on their elbows. The sea lions set the flavour of the south coast drive through the countryside and a sandy area called Little Sahara interesting, but this is an island for farmers, not fauna. The wildlife is more managed than we expected and it appears the koalas we see on the trees were introduced to save them from being wiped out on the mainland. It worked, but Galapagos this ain’t. 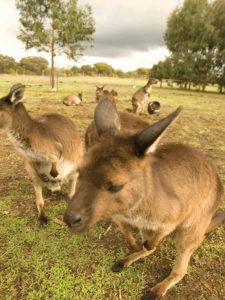 Parndana Wildlife Park was set up as an ‘animal refuge’, where sick, injured, orphaned or unwanted animals could find a home. Here you find collected animals from all over Australia, and you can land yourself in the middle of a raging ecological debate by getting to hold the koala. Petting is passé, cuddles a no-no in the modern ecological world. Not Galapagasian at all. The kangaroos are less controversial. They come in expectation of food, smaller and darker than their mainland cousins. Kangaroo Island has half a million of these curious kangaroos, a wonderful rare glossy black cockatoo, and a cute looking echidna (my favourite antipodean animal). One of Kangaroo Island’s most famous exports is the abalone, a sea snail coveted in Asian markets. It has to be tenderised and cooked carefully. It is very tough and highly over-rated, says Greg Roberts our guide. Its season, and the lobster season were over. The abalones are exportable, the view is not. We watched the suns seascape over the beautiful beach at Emu Bay, watching the reef herons, egrits and cormorants, set against the tranquil bay, the low light teasing the yellow shades out of the seaside rocks. Plans to set aside the western third of the island as a national park originated in the 1880s. Flinders Chase National Park, a sanctuary for a host of native Australian animals is the result of this but there are others, the Kelly Hill Conservation Park. Lathami National Park, habitat of the rare Glossy Black Cockatoo. Whoever named Remarkable Rocks was having an off day. They are scenic and of a different colour than those around them. Remarkable? Far nicer by name and nature is the Cape du Couedic, art house sculptures carved by nature out of the granite. After the landscape and animals time for the warm, rich limestoney Riesling and chardonnay. By the evening there is a feeling that Kangaroo Island has just started to open its secrets. Parndana Wildlife animal refuge where unwanted animals find a home. Lathami National Park, habitat of the rare Glossy Black Cockatoo, and country for the elusive echidna. Grassdale, part of the Kelly Hill Conservation Park with a large ‘mob’ of kangaroos, parrot and other bird species live in the tall gum trees. Koala Avenue just outside the park where koalas are easily seen in the ‘Manna Gums’ that grow in the area. Flinders Chase National Park, sanctuary for a native Australian animals. Admirals Arch, ancient limestone formation home to an active colony of the New Zealand fur seal.